Being unable to resist picking up something new, even "if" it has a cartoon show to go along with it, I picked up a couple of Chaotic packs and tried it out. I've one really serious question for the designers of the game: "What age group again are you looking at as your majority player-base?" This is a complicated set of rules, sub-rules and twisty thingamabobs (purely technical term there). I've enjoyed collectible card games for years, let alone the occasional good hand or so of Texas Hold'em, but this one is befuddling. My eight year old, who is trying to learn how to play chess and well is basically smart as a whip (all parents kids are genius's, just ask one), makes up his own set of rules with the cards I brought home, deigning not to get involved with the organic ruleset. Considering I often have my fingers in too many pies, I put Chaotic aside and moved on, hoping to return with a clearer schedule and mood to delve into it to give it a fair shake. During my time away, the website was entirely re-designed, significantly enhanced, and secondary market prices for some of the cards exploded, similiar to Magic the Gathering in it's heyday. As complex as MtG is though, it's still an easier pick-up game than Chaotic. Maybe my personal tastes are changing with time, but I prefer to spread my focus over many smaller games than make a huge investment of mental effort into one, simply to remain marginally competitive. If an in-depth ruleset, lots of expansion, detailed play and background are your bag, jump into Chaotic, you'll probably not regret it. To keep you abreast of some news in regards the game itself, I've added some notes on what will soon be released, so you can be prepared to pick up your collectible fun. 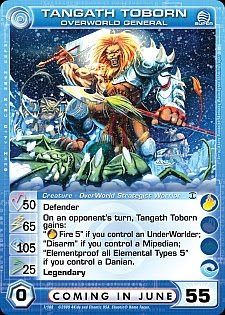 # Join the Forged Unity Pre-Release June 13th & 14th, 2009 and receive a Super Rare Tangath Toborn, OverWorld General just for playing! # Compete in one of the 11 Battledrome Championships being held in late June. The winner will walk away with a brand new Laptop! # The first Perim Championship will be held in Toronto on July 18th, 2009 at the Perim Tour: Toronto. Compete for your chance to win a High End Computer Gaming Bundle, Gaming Laptop, Nintendo Wii™, Nintendo DS™, and many other great prizes! # Visit the Chaotic Organized Play website at TCDOP.com for full details.